Sheila’s request is posted below and was also shared with The 1,000 Letters Lyme Campaign and in additional Facebook groups in recent days. So take note that if you remember seeing something like this already, it was most likely this request. 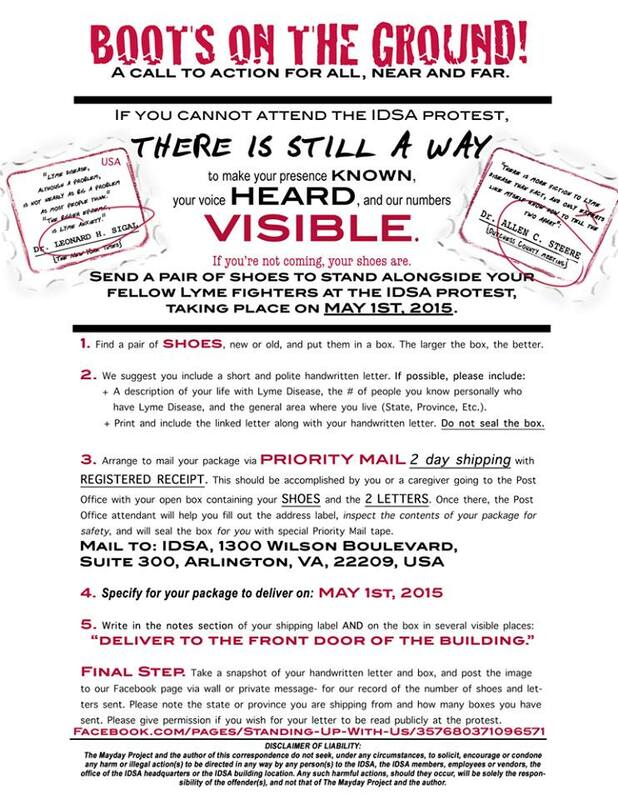 The intent is for the letters to be handed out at The MayDay Project’s Protest/Rally in Arlington (more info here and on their website) in order to illustrate the points and questions described in Sheila’s post, included below. Take a look at the recent request for Shoes for the protest as well (also see end of post) and information about the event (and why you should attend) and also watch for updates. An added benefit is that if you live in or were bitten in the Northern Rocky Mountains (broadly including MONTANA, WYOMING, IDAHO, NORTH DAKOTA, SOUTH DAKOTA, CANADA) your letter would be very valuable for the Stories section of Northern Rockies Lyme Disease Coalition’s new website (that I am still constructing). We are very new (Facebook page here), and plan to launch May. But you can preview the site and get ready to help us share our first announcements startomg Wednesday, April 15. If you are not part of this region, we still want and need your help, so please stay tuned! If you are willing to share your letter for the site, you can email it to northernrockieslyme@gmail.com and I have arranged to bring them to Sheila at the rally. You can also send them via facebook message (Invisibly Lyme Montana Page or brand new Northern Rockies Lyme Disease Coalition Page), or even as a comment here or on NorthernRockiesLyme.org. If you would like to share your letter after the fact, we are happy to receive them, but to have them printed for the rally through me, they will need to be recieved on or before April 27 and to follow the request from Sheila below. Everybody, we need as many of you as possible to *write a letter to a stranger walking down the street* for the Mayday Rally. If you had the opportunity to tell a complete stranger what Lyme disease has done to your life, what would you say? This is your chance to help educate the public about Lyme disease. We’re going to be putting our letters into sealed envelopes and then having passersby at the Mayday Rally reach into a bin and pull one out! This is a more intimate way of communicating what you’ve endured. Please include only your first name, your city, state and age and then share as much as you can about your Lyme disease journey. I personally will be including my Lyme journey poster with my letter. *How long have you been sick? *How long did it take to get a proper diagnosis? *How many doctors did you have to see to get that diagnosis? *Is it covered by insurance? *What has Lyme disease cost you (hobbies, dreams, career, etc.)? Feel free to paint your recipient a picture of what your life was like BEFORE Lyme and what it’s like AFTER. Please PM your letters to me (send me a friend request first so it does’t go in my “other folder”). I wish I’d had this idea two months ago, but I didn’t so we have to act quickly if we hope to get a lot of letters to the rally. ALL OF YOU ARE WELCOME TO WRITE, WHETHER YOU’LL BE ATTENDING MAYDAY OR NOT. If you write a letter but aren’t planning on going to the rally, feel free to tell your recipient that you’re not there because you’re too sick or because you’re too broke (or whatever the reason is). text me, I have unlimited or u can email me at stampbykor@aol.com or facebook me at KORY AMBRIZ JAMES.. I am so for the rife machine.. its so cool cause I sit in front of it and I can feel the swelling go down right in front of my very eyes…. I use it sometimes three times a day…I also use the CHI machine that runs oxygen through my body. I use many young living essential oils, and their supplements, I hope what I shared has helped at least one person…..and especially who is reading this and you who are in the medical field, please I beg you to research more on all confections which is under the umbrella of what most people know as LYME DISEASE. Thank you and God bless you for actually taking the time to read my letter I am a human being I breathe like you, I have a name it’s Kory James I’m 56 years young, I live in the country here in Minnesota. I want to ask you a question those of you in the medical field:.